My birthday was last week and I'm now the big 2-8. If I'm being honest, 27 is going to be a tough year to top! We traveled to a few really fun places, made a lot of great memories with our families and friends, and most importantly, welcomed Brecken into our lives, who has proven to be the greatest joy we ever could have imagined! There are a lot of people who moan and groan about growing older and while I understand why, I feel like I'm becoming more of the person I was created to be as time goes on. I said something similar last year when I turned 27, and it's amazing to reflect back on the past year and see that same sentiment ring even truer. Here's to another year of growth, of health & happiness, and of good food! Salads like this certainly help achieve all of those things. I've made this salad a few different times now and can attest to its super healthy and happy powers ;) We have always eaten it as a side dish, but add some protein (chickpeas, chicken) and you have yourself a satisfying main dish...maybe make some wheat oat flax buns to serve alongside! 1. 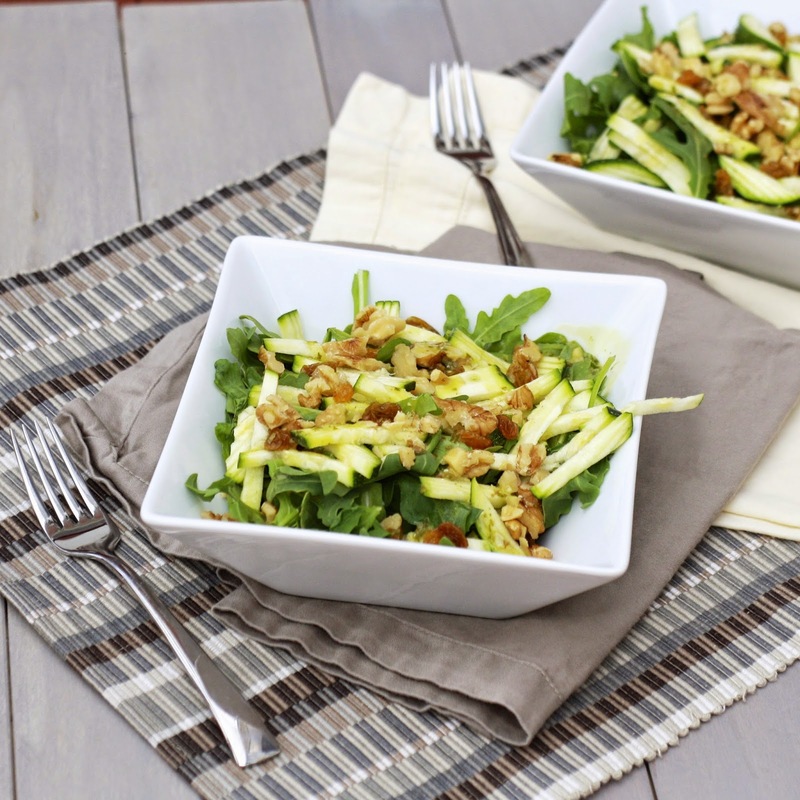 In a blender, combine the vinaigrette ingredients and blend until smooth. Set aside / refrigerate until ready to use. 2. 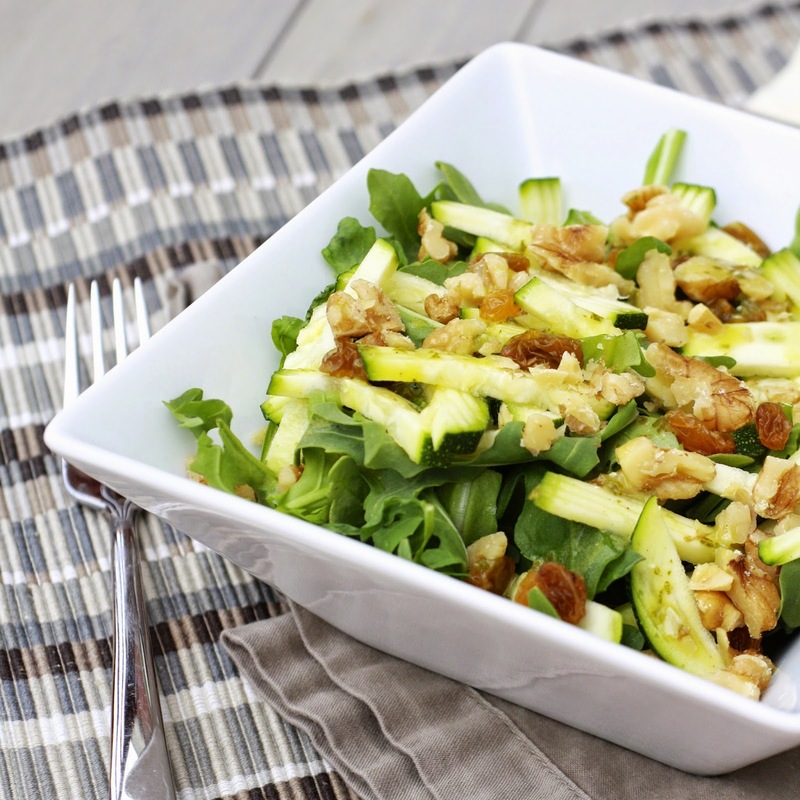 To prepare the salad, toss the arugula, zucchini, raisins, walnuts, green onions, and cheese. Add dressing to taste, tossing to combine. Serve immediately.